To celebrate the upcoming CD release party for my new CD Owls Calling I yarn bombed my vibes. Ok, you can see my house is cluttered. Note the Milt Jackson “Plenty Plenty Soul” record that just happens to be in the background! To make this I used the pattern Rainbows and Daisies Square from the Zooty Owl blog. The designer is Zelina Oliver and this is a free pattern on her blog. Since I needed squares that are approximately 2.5″ in diameter I only worked the first 3 rows of her pattern. Using a 2.75 mm C hook and Noro Kureyon Sock yarn I got 3″ squares. Because Noro is thick and thin the size of the squares varied. I decided that’s ok, this is Noro after all. 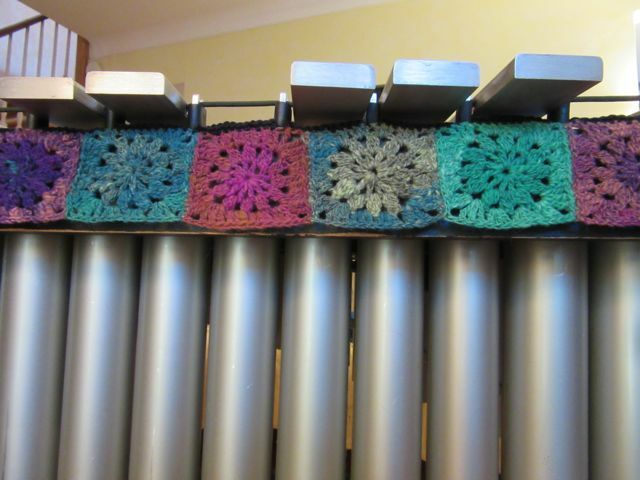 After joining I used Patons Grace, a cotton yarn, to single crochet across the top of the squares and made chain loops to attach the strip around the posts of the vibes. I decided against single crocheting across the bottom because I think the squares will show up better this way. If you are in the Chicago area you can check out my CD release party at the Green Mill on Monday October 19, 2015. If you’d like to check out my CD or download tracks you can do that here. 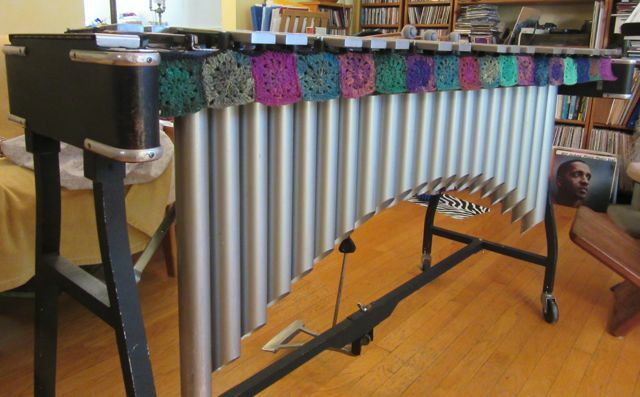 This entry was posted in crochet projects and tagged crochet, motifs, noro, owls calling, squares, vibes, vibraphone, yarn bomb. Bookmark the permalink. Two of my loves, crochet/fiber and jazz!!! Thanks. I hope to see you soon then. I love a good yarn bomb!